For those that don't know, this is an aftermarket mod for the Camaro to make it look like a pontiac trans am. Which was a very similar muscle car built by GM before pontiac as a brand was killed in the recession. 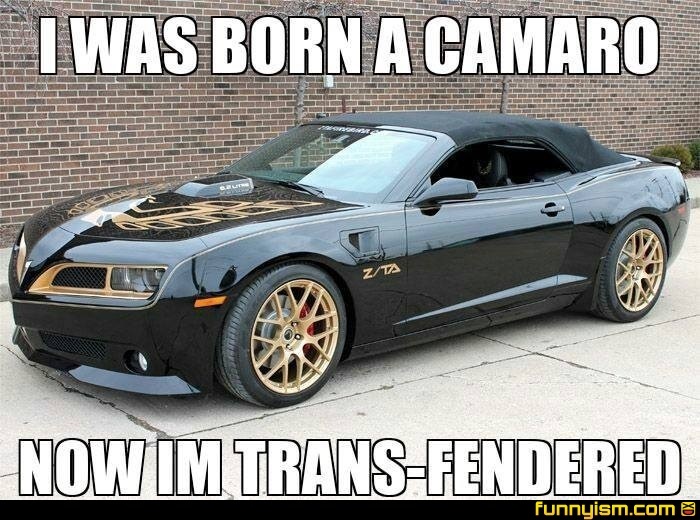 Before the only difference between the Camaro and trans was that they had different badges and body panels. It's meant as somewhat of a farewell for pontiac enthusiasts. @Gus300, *changes it to tri-force with some coloring* how about now? @Gus300, You're the first downvote top comment I have seen in ages... Fonz and Jamal would be proud! @Gus300, Are you kidding me?! Shaker scoop, trans am bird thing, AND better front end!? Whoever "defiled" that car deserves a throne of Pontiac engines with torches kept lit by rusty camaro parts. @sombrero mop, NOT UNTIL I GO INTO---- TURBO DOWNVOTE!! I'd rather have a challenger..oh wait I do.